"3LA1, V-2033" by Timothy K. Perttula and Robert Z. Selden Jr. CONTEXT INFORMATION: From a grave (Burial 1) excavated by Robert Shelton in 1940. Associated vessels include V-2030 to V-2032 and V-2034 to V-2039. DECORATION: The rim panel has a continuous scroll motif repeated four times, ending in excised brackets and a series of curvilinear engraved lines or negative S-shaped dividers. The scroll filler background consists of a series of small excised brackets and small excised triangles. Glassell Engraved, var. 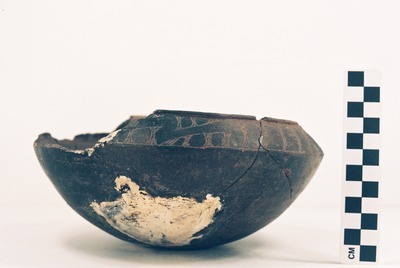 Atkins carinated bowl (5425-2031A).